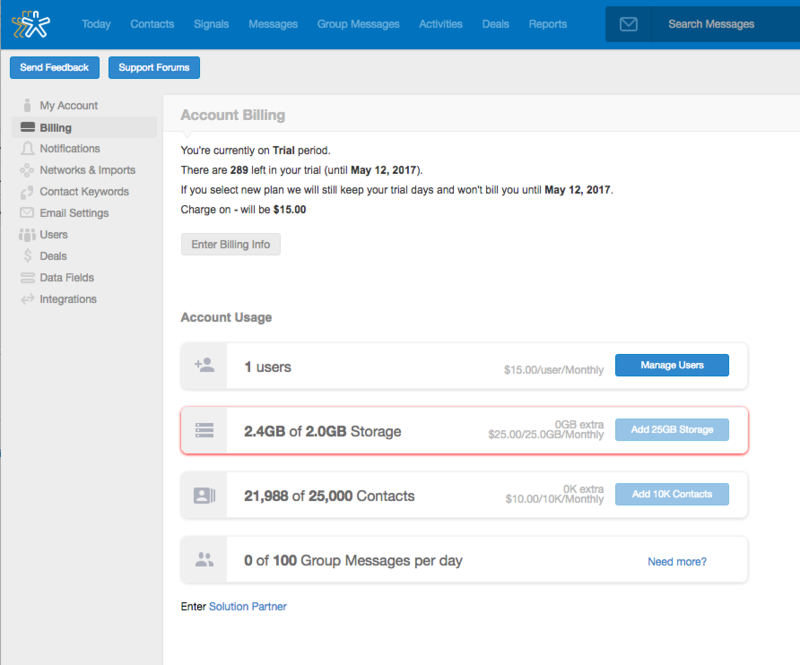 Storage in Nimble includes all messages, activities, and deals. Email messages, and attachments to those messages, are the main cause of high storage usage in Nimble. Contacts are counted separately, and are not included in your storage limit. For the baseline Nimble account, you will have up to 2 GB of storage per seat and up to 25,000 contacts to share with your team account. If you reach the 25,000 contact limit, you will need to add additional contacts on the billing page at a cost of $10 per month for an additional 10,000 contacts. Learn more about storage and contact add-ons here. What does it mean if I have reached my storage limit? You have most likely reached your storage limit due to a high volume of emails synced to Nimble. When the storage limit is reached, we stop syncing new emails until your plan is upgraded. 1. Delete older emails, particularly those with large attachments, from within Nimble or from within your email accounts that are connected to Nimble. 3. Or, if you do not need your older email history to appear within Nimble, you may simply disconnect your email account(s) from Nimble in Settings >> Networks & Imports, and reconnect them to start the sync over. 4. If you are an account administrator, you may then check your account storage in Settings >> Billing under "Account Usage" to see if you're below the current threshold. All other account users may review this information in their Settings >> Account Usage page.